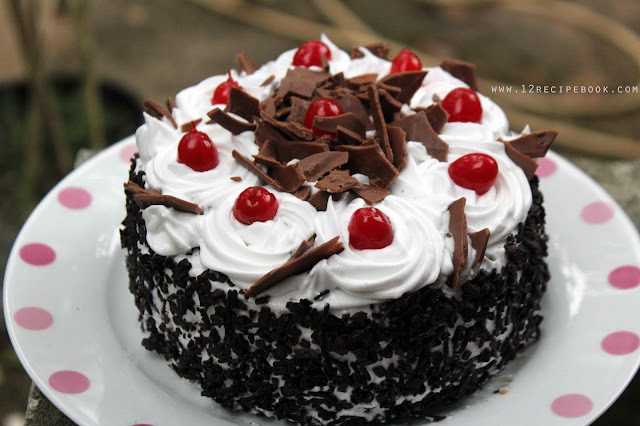 Black Forest Cake is all time favorite party preparation. 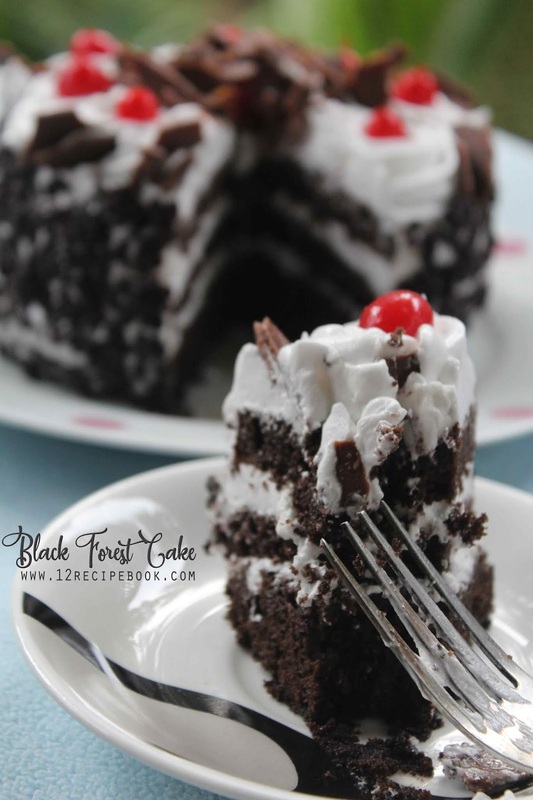 I already added three more recipes of black forest cake in my blog earlier. Here is another one. It's a mini cake flavored with little coffee powder and tastes super moist and delicious. The cake serves for 5 to 6 slices only. Hope all of you can try them easily at home and please don't forget to leave your valuable feedback's here in the comment box below. Grease a six inch baking tin with oil and dust some flour or place a parchment paper. Measure all the ingredients and keep it near by. Heat a pan on low flame by placing a stand inside (cover the lid also) until the batter gets ready. Crack two eggs in a bowl; add powdered sugar. Beat on high speed until triples the volume and becomes fluffy. Add vanilla essence, coffee powder, milk and oil. Then beat on low speed for few seconds (just need to give a good mix). Place a sieve on top and add flour, baking powder, baking soda and cocoa powder. Sieve it. Fold with a spatula to mix well. Pour the batter in to greased baking tin and lace it inside the pre-heated pan and cover the lid tightly. Cook on low flame for about 45 to 50 minutes. Check it is done or not by inserting a skewer inside. (If not done; cook 5 more minutes and check). Allow to cools down completely before frosting. Chocolate sprinkles-to garnish on sides. Beat the thawed whip cream until fluffy. Cut the cake in to two or three equal circles. Moist each layer with sugar syrup. Cover the cake completely with cream and garnish on sides with chocolate sprinkles. 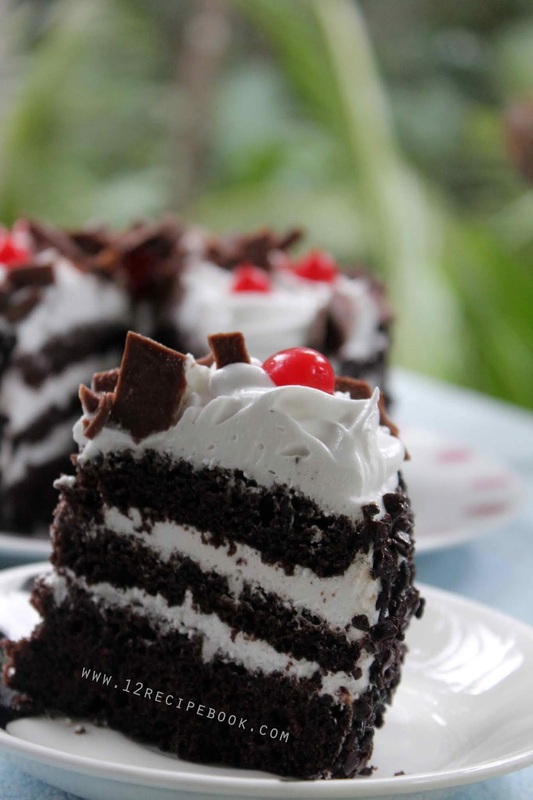 Garnish on top with whip cream flowers, chocolate pieces and cherries. Refrigerate the cake for at least 3 hours.